« My garden is growing! Written and recorded for the funeral of Lily Daggett, my sweet Gran, on Tuesday June 22nd, 2010. It’s always been hard being so far away from our loved ones, from our family. A phone call is never the same as a smile or an embrace. But sometimes, that’s all you have. For as long as I can remember, Mum and Gran would talk on the phone every week. And every week, when Mum hung up the phone, the first things she said to us all was “Gran sends her love”. It never failed, it was like clockwork. Every time they both said goodbye; Gran sent her love. Those four simple words became a comfort to me. They spoke so much about Gran and who she was. She was a lady who loved us all with a love that made us feel treasured. She was a lady who took tremendous pride in the family she had brought about. You would know that just by walking into her house. It was packed full of photos of us all, cards we had made for her, and presents she’d received throughout her lifetime. Every card, every photo, and every knick-knack had a story behind it, and Gran spent her life remembering and holding on to those stories because they meant so much to her. She was a lady who cherished those around her – her husband, her children, her grandchildren, and her great-grandchildren! When Gran “sent her love”, I felt cherished. I felt loved and I knew she was thinking of me. I felt just like that when I was with her. With every Sunday roast she prepared for us, and every party she threw for us, I felt special and I felt LOVED. She loved us in the simple ways, and those often mean the most. Well Gran, now it’s our turn. We send our love. We send it in our tears and our sadness. We send it in the special memories we have of you. We send it with balloons, with stories that we share, and with photos of you. We are thinking of you, we cherish you, we miss you, and we love you with our whole hearts. Just as you kept everything we ever gave you, we keep your memory in our hearts. Just as you surrounded yourself with things that reminded you of us all, we surround ourselves with your love. We remember your story and we celebrate your life. Thank you for everything you gave of yourself, we are all better people for it. Thank you for your kindness, your patience, your joy, and your unconditional love. 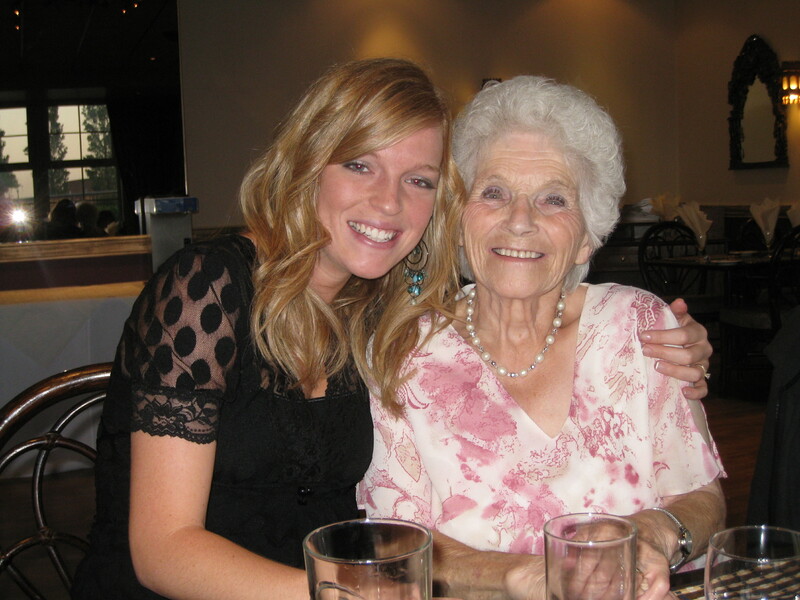 I send my love to you, my beautiful Gran, my precious Lily. And I carry your heart in mine, forever. This is very moving and beautiful, Hannah. Thank you for sharing it with all of us. I’m so sorry to hear about your loss. Peter and I have been and will be praying for you and your family.